WHY DO WE CARE ABOUT BIODIVERSITY? Ground covers rich in plant species are very important for soil conservation and the maintenance of soil fertility. In order to maintain a species-rich ground cover we avoid the use of chemicals for weed control. Plus we look after the traditionally managed meadows located along the banks of the Fontilleiro river which are adjacent to our vineyards. Those species-rich meadow are the source of many of the plants that colonize and add biodiversity to the herb layer of our vineyards. 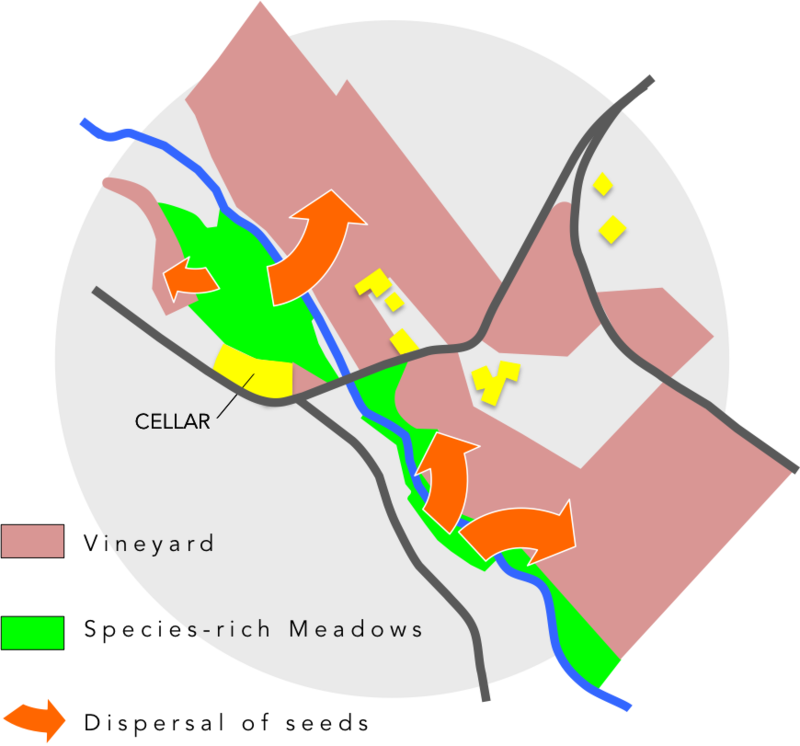 Traditionally managed hay meadows are species-rich habitats acting as sources of seeds that enhance plant diversity in the surrounding vineyards. Predatory insects, including parasitoids, such as many of the tiny wasp species and hoverflies can be very helpful and reliable allies to control pest damage in vineyards. These beneficial insects need flower-rich habitats during part of their life cycles. Researchers have found that the abundance of beneficial insects in vineyards depends on the presence of flower-rich habitats. Likewise, the reduction in pest populations is higher close to those habitats. 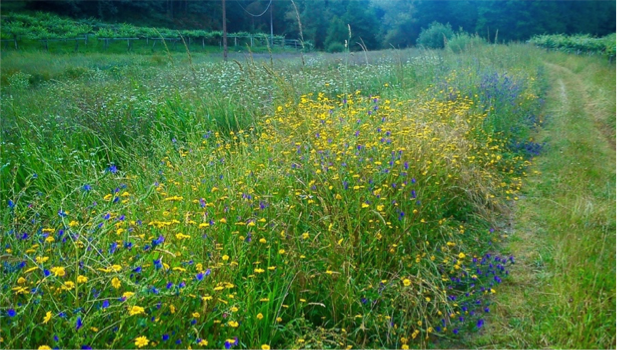 That is one of the reasons why we conserve the wildflower strips that grow by our vineyards. They are important habitats for beneficial insects! La vegetación que crece a lo largo de los bordes de los caminos es un hábitat importante para los insectos beneficiosos. Willow osiers are planted along the Fontilleiro river to mitigate pollution derived from agricultural practices. The natural vegetation that grows along the river banks is essential for good water quality and the conservation of river ecosystems. Indeed some wetland plant species are able to remove pollutants from water and soil. Two plants with such properties that are commonly found in CastroBrey are willow trees and the yellow iris. Thus, by planting osiers (a species of willow) we aim to protect the Fontilleiro river ecosystem, the ecological backbone of CastroBrey. 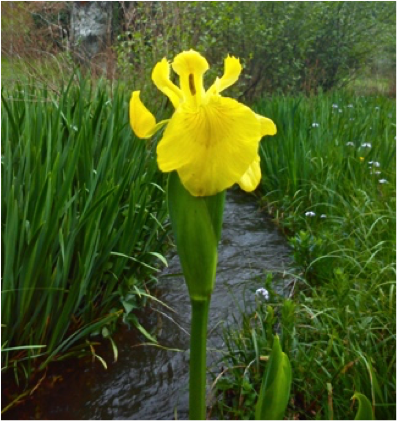 The yellow iris is one of the plants that contributes to good water quality in CastroBrey. 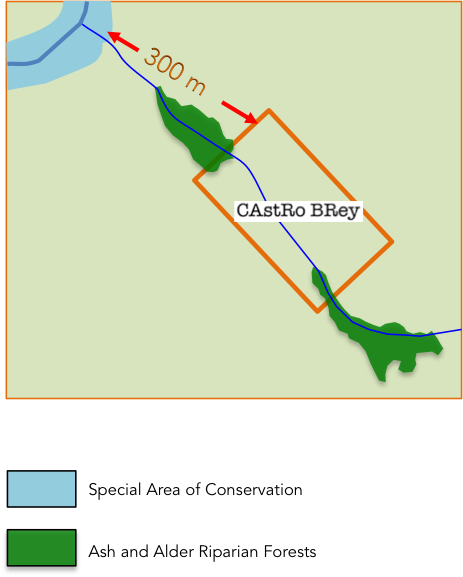 CastroBrey is flanked by two patches of an European priority habitat and is adjacent to a Special Area of Conservation that makes part of the Nature 2000 network. CastroBrey is embedded in a landscape that includes some of the most valuable natural habitats in Europe. This is specially true for the ash and alder forests that grow in river banks as they are considered a priority habitat by the EU Habitats Directive. Technically, they are termed as “Alluvial forests with Alnus glutinosa (alder) and Fraxinus excelsior (ash)” and are considered a priority habitat (code 910E) under the Habitats Directive of the European Union. This type of riparian woodland is found in association with river streams and wetlands, including areas that are periodically flooded. There are two patches of riparian woodland in the close vicinity of CastroBrey which have colonized two riverbanks where the Fontilleiro river divides into several branches. These young woodlands (30 to 40 years old) are in good condition, specially the upstream one. They have a closed canopy and quite a high density of trees including alder, ash and three species of willow. Canopy cover and the proximity of the water table to the surface are the main factors determining the flora and vegetation of the lower forest layers. In areas where the soil is not waterlogged the biodiversity of trees and shrubs is enhanced with hazels, sycamores, oaks, elderberries and alder buckthorns. The flora of the ground layer, adapted to life in shaded and wet conditions includes wetland flora (sedges and reedmace), patches of ferns and such delicate and attractive flowers as the marigolds and the wood anemone. Owing to the historical regression and the poor conservation status of the climacic chestnut and oak woodlands, riparian woodlands act as refuges for many woodland species. Thus, the assembly of species in riparian woodlands includes not species associated to river and wetland habitats plus typical woodland species. The position of riparian woodlands along river courses means that they exert a strong influence on the quality of the water environment, helping to protect it from activities on the adjacent land. Another important function is that they contribute to the ecological integrity of the landscape as ecological corridors for the animals and plants of forest habitats. Some 300 m away from CastroBrey vineyards lies the "Ulla-Deza River System" a Special Area of Conservation that makes part of the Natura 2000 network of European protected areas. Stretching over 18 % of the EU’s land area and almost 6 % of its marine territory, it is the largest coordinated network of protected areas in the world. It offers a haven to Europe's most valuable and threatened species and habitats. The river ecosystems along the Ulla watershed and their associated habitats include the majority of the natural systems of a large territory extending from the marine estuaries of the bottom of Ría de Arousa to the Portodemouros reservoir, 10 km north of CastroBrey. The main water courses of the Ulla watershed were designated as a Natura 2000 site, the Ulla-Deza River System (SAC ES1140001), as part of the Natura 2000 network of protected areas. CastroBrey vineyards extend along the margins of the Fontilleiro river, a small stream that flows into the Ulla river. In terms of ecology and biodiversity conservation the habitats associated to the Fontilleiro river, as well as the river itself, are the most vulnerable and valuable areas of CastroBrey. It is our responsibility to make sure that our activity poses no threat to those habitats and the species that live in them. The conservation of such a precious natural treasure is one of our priorities. The Ulla-Deza River System is a Special Area of Conservation that makes part of the Nature 2000 network of European protected areas.